Alina is wearing a Bess NYC top, X-Girl Japan skirt, Addiction handbag and Vintage Pollini boots. Jordy is rockin' a very interesting tee! Apologies to all U2 fans! Be a kid again and buy a new box of CRAYONS and make a poster! Did you know that Crayola is going GREEN? 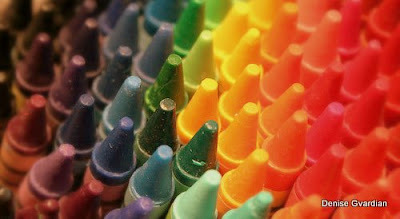 They're making crayons using SOLAR ENERGY and MAGIC MARKERS made with recycled plastic. Have fun playing with new colours of MAKEUP! Treat yourself to an end of summer FACIAL. It'll feel great to deep clean the skin after such a humid summer! To save $$ I like to go to a school for Cosmetology where the students who are about to graduate perform the facials alongside the instuctors. Try the Christine Valmy School on Fifth Avenue. My favourite model Scott in an anti-hate tee-shirt. So True...Why can't we all just get along?